Note: If you reached this post through the Guardian Higher Education Network you may want to browse the panel above this post, or explore the main page of this blog for the latest posts and updates. I sometimes receive quite specific requests about social media, new tech or other slightly more tangental things. A few weeks ago I was asked for advice on Visualisation tools for a research project and thought that others here might be interested in the tools, sites and resources that came to mind. The links and recommendations come from a mixture of angles: some I’ve looked at or been aware of through specific work projects; some come recommended by colleagues as new, interesting, or well crafted; and some came from looking for visualisation options for my MSc in eLearning dissertation. Do let me know what you think of any of these tools or the list itself and I’ll be very happy to update the list if you have others to recommend! 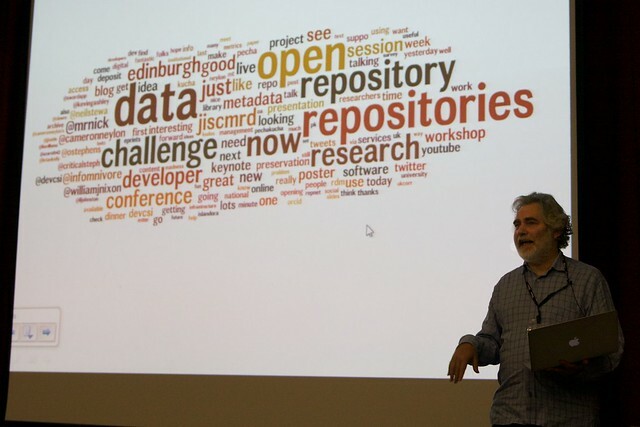 Image of the Closing Session at OR2012 with Wordle by Adam Field shown in the background. Textal is a new and more academically-targetted and mobile-friendly alternative to Wordle, specifically designed for use with text research data sets. I think it should be due out soon… : http://www.textal.org/. There are various examples of these being used well on the web but they really come into their own when you hook up a data collection form to a spreadsheet and then visualise it – it all connects up rather nicely. Voyant Tools offers a number of approaches to large cohorts of prepared text-based data. It’s worth noting that, as with all of these tools really, you should anonomise and edit the text before submitting it. That’s particularly important for Voyant Tools as you can’t edit the data once it’s up and you can’t delete it easily either. But it does clever stuff in a simple way and for free: http://voyant-tools.org/. SourceMap is a web service that lets you create one type of visualisation – maps visualising “where things come from” whether those be sources, commodities, trade routes, etc. Very useful but only if that’s the visualisation you actually want to create: http://sourcemap.com/ You can find some good examples of these visualisations over on my Trading Consequences’ colleague Jim Clifford’s blog. British Tallow trade map by Jim Clifford. Click through to see his full blog post about these maps. I must note two fabulous blogs for finding out about these: Tony Hirst’s OUseful blog; Martin Hawksey’s MASHe blog. Both are brilliant resources and contain many many more recommendations for software for visualisation and data analysis. Visualisation of Facebook photo virality featured on Flowing Data. Click through to read the full article. Steven Gray specialises in working with data and geospatial data visualisation with several very interesting current projects (including Textal). His Big Data Toolkit website http://bigdatatoolkit.org/ includes updates on his research, links to useful resources, discussion of ideas, etc. Martin Hawksey (already mentioned above) of JISC CETIS blogs at MASHe (http://mashe.hawksey.info/) and often examines data analysis and visualisation including some superb work on Twitter data and visualisation. A search or browse of his blog for visualisations should find some interesting examples using web and downloadable data visualisation tools. As with any of these notable folks he is likely to respond to comments or questions so do comment on his blog! Visualisation of UK University Twitter Following patterns by Martin Hawksey. Click through to read more about this visualisation and view his and Tony Hirst’s IWMW 2012 presentation on Data Visualisation. Tony Hirst (already mentioned above) of the Open University blogs at OU Useful (http://blog.ouseful.info/) and his posts often revolve around visualisation of data, particularly social data. I would recommend having a browse around his site (e.g: http://blog.ouseful.info/?s=visualisation) and leaving comments/questions. This section focuses on those who offer visual inspiration and expertise. I had hoped to include Douglas Coupland who worked on a very creative data visualisation project a few years back but I can’t recall the name of the project nor find the link – do let me know if you can help me out with a link here. Screenshot from Ellie Harrison’s most recent web project Trajectories. Click through to access this art project which uses visualisation to explore self comparison. Hopefully some of the above will be of interest/useful to you as well as the person who originally asked the question. As I’ve already said I’d appreciate any comments, additions, etc. you may have. Visualisations aren’t the core thing I spend my time on but images and visual aspects are so important to making an impact on social media that they are, of course, an area of great interest. 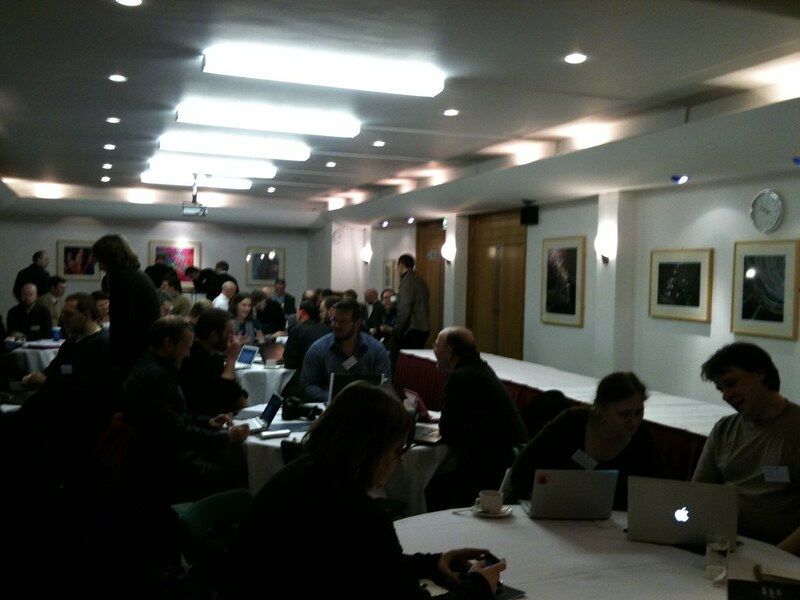 Today I will be live blogging Haggis and Mash, a mashed library event taking place at the National eScience Centre in Edinburgh. This means this post will appear incomplete/updated all day. Formatting tweaks and the odd fix of typos and names coming soon. Apologies for picture quality – largely taken on my phone at handy opportunities. The day kicked off with a lot of hellos and registration. I’ll be blogging all day – for more information on the programme have a look at the mashed library wiki here: http://www.mashedlibrary.com/wiki/index.php?title=Haggis_and_Mash.